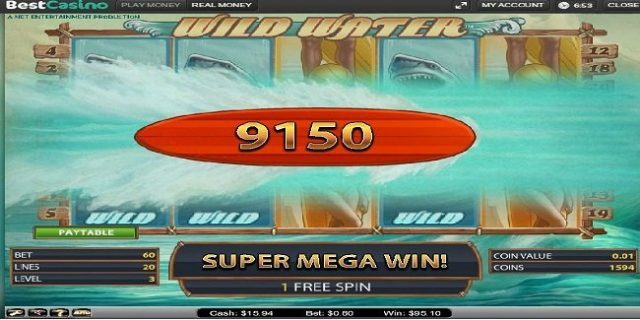 Wild Water is a NetEnt based 5 reels and 20 paylines video slot game, which offers a jackpot of 2000 coins of your bet. The game includes a wild symbol i.e. Shark and the scatter symbol featuring a Surfer. The reels of the game are being set against the backdrop of water. Playerscan check out Wild water slot game for free or with the help of real money at any of these NetEnt casinos. This slot game includes some of the basic functions such as ‘Level” which is used to select the preferred level, “Coin value’ is used to alter the coin size, “Spin” is used to spin the reels in motion for a chosen wager. ‘Max bet” and “Auto Play” options are also available in this game. The game is 20 paylines for which minimum and maximum coins per line is 1. Players can play the game for a chosen coin size which ranges from 0.01 to 0.5. Players will receive free spin when they land on 3 or more scatter symbols on any 3 active reels. But additional free spin cannot be won during free spin feature round. During free spin feature Wild Sharks automatically expands to cover the entire reel.